T. C. Within the framework of the provisions of Law No. 4046 on Customs Implementation by the Prime Ministry Customization Administration (Administration), the immovables on the table will be privatized by “sales” method. 3- In order to participate in the tender, it is obligatory to receive separate Bidding Documents for each immovable and to submit the bids to the address of Ziya Gökalp Caddesi No: 80 Kurtuluş / ANKARA by 5:00 pm on the last bidding day. 5- The privatization tender is not subject to the Public Procurement Law no. 2886 and the Administration is free to do or not to do the procurement. The Contracting Entity is free to extend the deadline for submitting tenders by a certain amount or by a certain amount to be determined. This will be announced before the end of the last bidding period. 7- The sale of the tendered immovable properties to real persons with foreign nationality, to companies with legal personality established in foreign countries according to the laws of their own countries and to foreign-owned companies established in Turkey, subject to the provisions of the Direct Foreign Investment Law, Other Laws related to the Land Registry Law. These persons are obliged to investigate whether the sale is possible and to take necessary actions in the shortest time if they win the tender. 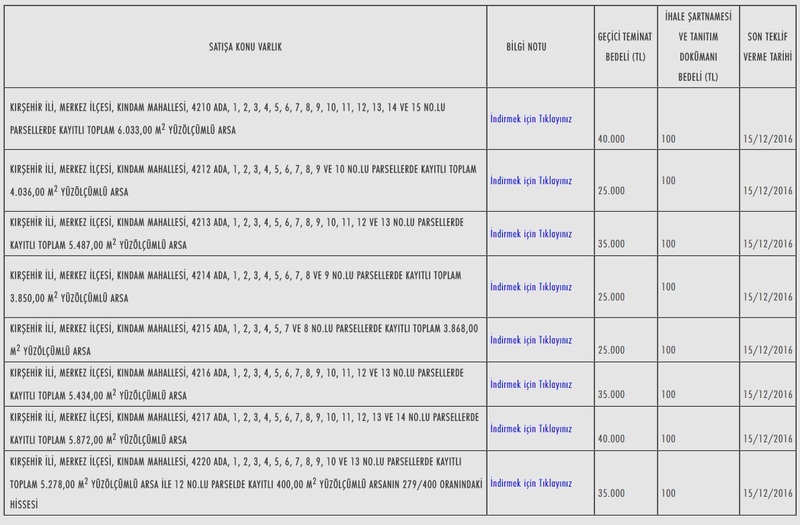 9- Further information can be obtained from the telephone number 0 312 585 84 54-585 84 91, the facsimile number 0312 585 83 54 and the address www.oib.gov.tr. 3- İhaleye katılabilmek için her bir taşınmaz için ayrı İhale Dokümanı alınması ve tekliflerin İdarenin Ziya Gökalp Caddesi No: 80 Kurtuluş/ANKARA adresine son teklif verme günü saat 17:00’ye kadar elden teslim edilmesi zorunludur. 5- Özelleştirme ihalesi, 2886 sayılı Devlet İhale Kanununa tabi olmayıp İdare ihaleyi yapıp yapmamakta, dilediğine yapmakta serbesttir. İdare son teklif verme tarihini belirli bir tarihe kadar veya bilahare belirlenecek bir tarihe kadar uzatmakta serbesttir. Bu husus son teklif verme süresinin sona ermesinden önce duyurulacaktır. Asgari %20 (yüzdeyirmi)’si Varlık Satış Sözleşmesi imza tarihinde peşin, bakiye anapara borcu ise azami 12 (oniki) ayda bir ödeme yapılmak kaydıyla en çok 48 (kırksekiz) ayda ve eşit taksitlerle, bakiye anapara borcu üzerinden vade tarihleri itibariyle hesaplanacak vade farklarıyla birlikte ödenecektir. İhale bedellerinin vadeye bağlanan tutarına, Varlık Satış Sözleşmesi imza tarihinden itibaren yıllık %10 (yüzdeon) oranında basit faiz uygulanacaktır. 9- Ayrıca 0 312 585 84 54-585 84 91 numaralı telefonlardan, 0312 585 83 54 numaralı fakstan ve www.oib.gov.tr adresinden ihaleye ilişkin bilgi alınabilir.